The article analyses the constitutionality of recently passed Twenty First Amendment (hereinafter the “21st Amendment”) to the Constitution of Islamic Republic of Pakistan, 1973 (hereinafter the “Constitution”), through the Constitution (21st Amendment) Act, 2015 (hereinafter the “Amendment Act”), on the touch stone of existence of basic structure in the Constitution, as has been established by the superior Courts. This 21st Amendment was passed in the aftermath of 16th December, 2014’s tragic incident of terrorist attack on Army Public School, Peshawar, which left 141 dead, including a majority of children and other staff members. As a result, in order to console the grieving nation, and to wipe the tears of every mother who had lost their children in this unfortunate attack, the Government of Pakistan, in collaboration with the army, decided to eradicate terrorism from the country. For this purpose, the government decided to legislate military courts, the operation of which would, ‘inherently’, be protected from any violation of the fundamental rights, as enshrined in the Constitution, as a result of the said Amendment. The basic aim of passing the said amendment was to give constitutional cover to the establishment and operation of the military courts, with the aim to convict the terrorists who have been acquitted either for non-availability of evidence, or due to inability of prosecution to prove their offences beyond reasonable doubt. The preamble to the said Amendment Act outlines and states that, to cater to the existing extraordinary circumstances of “grave and unprecedented threat to the integrity of Pakistan”, special measures are required to be taken for speedy trial of the offences relating to terrorism and waging of war against Pakistan. As a result, under the garb of this constitutional cover, ‘military courts’ were established to conduct the trial of select few cases relating to terrorism. Originally, in the Constitution, there are three ‘constitutional’ courts established (Article 175), which include the Supreme Court of the country, High Courts for all the four provinces, and a High Court for Islamabad Capital Territory, and the Federal Shariat Court (Article 203 C), whose jurisdiction and powers have been given in the Constitution itself. With the passing of 21st Amendment (along with the subsequent amendment in Pakistan Army Act, 1952), a special court has been created for the trial of terrorists belonging to certain organizations which work under the name of a religion or a sect. It is argued that, by constituting this special court, through a proviso to Article 175 of the Constitution, the legislature has curtailed the power of other Courts. As a second fold of the said 21st Amendment, certain other secondary legislations have been protected from the applicability of prohibitory clause of Article 8 of the Constitution. Pursuant to the passing of the 21st Amendment, the same is now before the august Supreme Court of Pakistan, and in this regard, the arguments have been made that the 21st Amendment is encroaching upon the basic structure of the Constitution, and is, therefore, liable to be declared as unconstitutional. As for now, the 17 member (full) bench of the Supreme Court of Pakistan has reserved its decision on the validity of 21st Amendment, and yet to release the verdict. The idea behind this constitutional doctrine of basic structure is that there are certain features of the ‘fundamental law’ of the land, which cannot be amended by the actions of the legislative. In this regard, there are legislative instruments, as well as judicial pronouncements supporting this very idea of existence of basic structure. Historically, the legislative origin, of this doctrine, is the Basic Law of Federal Republic of Germany, 1949. At the time of promulgation of the Basic Law of Germany, the text contained Article 79, which expressly bars the legislature from amending the “division of the Federation into Laender”, “the participation in principle of the Laender in legislation”, and “the basic principles laid down in Articles 1 and 20”, of the Basic Law of Germany. On the other hand, the judicial origin is the jurisprudence established by the Indian superior Courts. He was Prof Dietrich Conrad, head of the law department at the South Asia Institute of the University of Heidelberg, and the author of the doctrine that “the basic structure” of a constitution cannot be changed, who enlightened the Indian Lawyers about the idea of Basic Structure of a constitution, that made an essential part of Indian jurisprudence. The Courts of India have, time and again, decided on the issue whether the amending power of Parliament is absolute of not, and right now, following is the position of this doctrine in the jurisprudence of India. In India, there are two basic cases on the issue where the question of amending power of the parliament (Article 368), under the Constitution of India, 1949 (hereinafter the “Indian Constitution”) was discussed and decided upon. In this regard, first case is I. C. Golak Nath Vs. State of Punjab, the 1967 judgment on the question of amending power of the Parliament of India, where it was held that the Parliament cannot amend the fundamental rights’ part of the Indian Constitution in a way that it curtails the ambit of these fundamental rights. The two issues, discussed in the case of Golak Nath were that whether the act of Parliament, amending the Indian Constitution, fell in the definition of ‘Law’ as provided in Article 13(2) of the Indian Constitution, and whether the amending power of parliament extended to amending the fundamental rights as well? To the first issue, the court held that the any amendment to the Indian Constitution must be deemed ‘law’ as understood in Article 13 (2). For the second issues, majority of the judges in Supreme Court of India ruled in the favor of limited amending power of the parliament. However, in the latter case of Kesavananda Bharati Vs. State of Kerala, the Supreme Court of India recognized the Indian Parliament’s right to amend the Indian Constitution, and restricted this amending power to the extent that it would not take away the basic structure of the Indian Constitution. In Kesavananda’s case, it was held that what can be constituted as the ‘basic structure’, includes, inter alia, the status of basic land of law, the religious/secular character of the Constitution, the form of Government, and the character of the Constitution. According to Lord Birkenhead, L.C., this basic structure of the Constitution is based on the foundation that is enshrined in the constitutional freedoms. In the said case, the six judges, led by Chief Justice, had mentioned specific provisions which may not be abrogated by the exercise of power under Article 368 of the Indian Constitution. However, these six judges who held that the ‘essential elements’ or the ‘basic features’ of Constitution cannot be abrogated did not give a definitive list of these basic features. However, the following general points are to be noted about the ‘essential elements’ or the ‘basic features’. First, the features that are being talked about as the basic ones, are not the definitive provisions in the Indian Constitution, however, they are only the general principles like republican or democratic form of government, the federal character or the separation of powers, etc. Secondly, these principles are not the exhaustive ones, but are only the descriptive ones explaining the structure of a constitution, in contrast, what matters is the general doctrine that these features cannot be abrogated. As has been given in the discussion of the case, there are differences in the lists provided by each opinion in the judgment of the case. Sikri, C.J., explains the basic structure as including, supremacy of the Constitution, Republican and Democratic form of government, secular character of the Constitution, separation of powers between the legislative, executive and judicial organs, federal character of the Constitution, deciding further that the above said basic structure is based on the foundation of dignity and freedom of the individual, as the basic features of the Constitution. The enumeration of basic elements in the constitutional structure, in the opinion of Shelat and Grover, JJ., includes all the features, as discussed by Sikri C.J., with the difference that it expands what Sikri, C.J., refers to as “dignity and freedom of the individual” to read, “the dignity of the individual secured by the various freedoms and basic rights in Part III”. They also add to the list two more items, namely, “the mandate to build a welfare State contained in Part IV” and the “unity and integrity of the nation”. The opinion of Hegde and Mukherjea, JJ., does not number the items it lists. It includes the items of national unity and welfare State added on by Shelat and Grover, JJ., but does not repeat the entire list given in the Chief Justice’s opinion. The items that are not included in the list of these judges, but were a part of the earlier ones, include ones regarding the supremacy of the Constitution, the secular and federal character of the Constitution, and the separation of powers. Reddy, J., does not mention, in his final collection, the federal character of the Constitution mentioned by Sikri, C.J., and replaces the Chief Justice’s item on separation of powers by a mere mention of “the three organs of State” without mentioning “separation”. He does not mention unity and integrity of the nation, the “secular” element, the federal character of the Constitution, or the supremacy of the Constitution, in this final collection. Fourthly, in the four opinions on behalf of the six judges included the fundamental rights, specifically, considering them as the essential feature of the Indian Constitution. In the opinion of Khanna J., the provisions laying down the fundamental rights are subject to abrogation as any other provision of the Indian Constitution. According to him, “[t]he word ‘amendment’ in Article 368 must carry the same meaning whether the amendment relates to taking away or abridging Fundamental Rights in Part III of the Constitution or whether it pertains to some other provision outside Part III of the Constitution”. In consequence thereof, with a majority of 7-6, the Supreme Court of India held that although the Parliament of India has wide power to amend the Indian Constitution, it did not have the power to emasculate the basic elements of fundamental structure of the Constitution. In the later cases, the Indian Supreme Court had adopted the doctrine of Basic Structure, for instance, in the case of Indira Nehru Gandhi Vs. Raj Narain and ANR the Court while restoring the Indian Democracy, struck down the thirty ninth amendment to the Indian Constitution. Relying on the famous case of Kesavananda Bharati’s Case, the Supreme Court of Bangladesh, in 1989, adopted the Basic Structure Doctrine in its constitutional structure. While deciding the case of 8th Amendment to the Constitution of Bangladesh, 1972 (hereinafter the “Bangladesh Constitution”), the Supreme Court of Bangladesh upheld the Article 7 of the Bangladesh Constitution. Two writ petitions were filed challenging the amendment in Article 100 of the Bangladesh Constitution, through the Constitution (Eighth Amendment) Act, 1988, and the notification of Chief Justice on the ground that High Court division of the Supreme Court with judicial power over the republic is a basic structure of the Bangladesh Constitution, and therefore cannot be altered or amended. The writ petitions were dismissed by the Division Bench of the High Court. The appeal was allowed by the Appellate Division, which along with the appeals of Anwar Hussain Chowdhury Vs. Bangladesh were filed before the Supreme Court of Bangladesh, and is popularly known as Eighth Amendment Case. While striking down the 8th Amendment, B. H. Chowdhury J. listed down 21 features, to be known as basic features of the Bangladesh Constitution, which are unamendable. Moreover, Shahbuddin J. held that the constituent power, to make the constitution lies wholly with the people, and is adopted by the parliament as a derivative power, and this derivative power cannot immune the amendment from challenge. As a result, through the case of Anwar Hussain, the Supreme Court adopted the basic structure doctrine, and it enshrines in the constitutional structure of independent Bangladesh. The debate as to what constitutes Basic Structure of the Constitution (if there exists any) has always been a topic under discussion among the legal fraternity in Pakistan. There have been litigation on this issue, however, no concrete decision has been laid down by our superior Courts. One such example is the case of 18th Constitutional Amendment, in which the Court had to decide, inter alia, on whether the 18th amendment infringes upon the basic structure of the Constitution or not. This question had never been decided by the Court, and now the case is being put up with the case of 21st Amendment. Beside the major cases, the discussions have been done, debates have been conducted, scholarly articles have been written giving personal opinion whether there exists any basic structure of the Constitution or not. However, it is imperative to note that the judges, scholars and writers are always inclined towards negative, when there comes the debate of existence of basic structure in the Constitution, more than they positively favored it. The superior Courts of Pakistan are always resistant in adopting this doctrine, and as a result they have found a way away from deciding this fundamental question. In this regard, it is pertinent to discuss the important cases, where the Supreme Court of Pakistan has vaguely decided the issue of basis structure of Pakistani Constitution, as well as the cases in which Supreme Court has decided upon the question of Court’s power to strike down a legislative amendment. The terms ‘nature’ of the constitution, and ‘basic provisions’ has firstly been coined in the case of Fazlul Quader Chowdhry Vs. Muhammad Abdul Haque where the court while deciding the scope of Article 224 of the 1962 Constitution, held that the “aspect of the franchise, and of the form of the Government are fundamental features of a Constitution” and therefore “the Constitution was not intended to be varied according to the wishes of any person or persons”. In State Vs. Zia-ur-Rehman, the Court held that the judiciary, in exercise of its judicial power, cannot strike down a provision of the Constitution. All it can do, is to interpret the same. Since, the Supreme Court itself is the creature of the Constitution, so it neither can claim, nor has the right to strike down the provision of the Constitution. In the case of Islamic Republic of Pakistan Vs. Abdul Wali Khan, Mr. Justice Hamood ur Rehman, the then Chief Justice, while quoting his own decision in the case of Province of East Pakistan Vs. Siraj ul Haq Patwari said that “the court should lean in favor of upholding the constitutionality of a legislation and it is, therefore, incumbent upon courts to be extremely reluctant to strike down laws an unconstitutional”. Furthermore, while avoiding getting into the discussion of whether the fundamental rights can be abrogated through a constitutional amendment, said that the issue before this court is to decide that whether the court can strike down any provision for being violative or repugnant. To this question, their answer was negative. In Al-Jehad Trust Vs. Federation of Pakistan, the Court, instead of adopting the basic structure doctrine, has pressed in to service the rule of interpretation that if there is a conflict, the provision which contains lesser rights will yield in favor of the provision which contains higher right. In Wukula Mahaz Barai Tahafaz Dastoor Vs. Federation of Pakistan the court held that “when an impugned Constitutional amendment is of such a nature, which tends to destroy any of the basic features of the Constitution without which the State could not have been run as was originally mandated by the framers of the Constitution” cannot be upheld as it destroy the basic feature of the Constitution. However, the court said that what are the basic essential features of the Constitution of Pakistan is yet to be answered with clarity. The Court quotes three basic features of the Constitution, as narrated by the counsel for Petitioners; “representative form of Government, Islamic concept of democracy and independence of judiciary.” The Court held that the concept has remained alien to the courts of our country, and has not been consistently applied in Pakistan. In Syed Zafar Ali Shah Vs. Federation of Pakistan, this Court held that “the Constitution of Pakistan is the supreme law of the land and its basic features, i.e., independence of judiciary, federalism and parliamentary form of government blended with Islamic Provisions, cannot be altered even by the Parliament”. While deciding upon the coup of Musharraf, the Court held that he could amend the Constitution, but he could not alter the basic structure of the Constitution, which include the abovementioned features. In 2005, in the case of Pakistan Lawyer’s Forum Vs. Federation of Pakistan, the Supreme Court while deciding the constitutionality of 17th Amendment to the Constitution, decided that the Basic Structure Doctrine is acknowledged to be in existence in the Constitution, however, there are limitations on the power of Parliament to make amendments. It was said that this can’t be exercised by the judiciary but by the body politics of the country. Furthermore, it was observed that this Court can only set aside a constitutional amendment if it is not passed in accordance with the procedure of passing an amendment as laid down in the Constitution. Finally the court concluded that “the theory of basic structure or salient features, insofar as Pakistan is concerned, has been used only as a doctrine to identify such features”. The 21st Amendment to the Constitution has been passed through Amendment Act, on 06th January, 2015 to remain as a part of the Constitution for a period of two years. The preamble of the Act lays down the scope of the 21st Amendment, the reasoning of the legislature, as well as the meaning given to the insertion of specific provisions in the Constitution. For this purpose, it is imperative to discuss the certain parts of the Amendment Act. The preamble states that ‘extraordinary situation and circumstances’ exists which have put the country in crisis. The 21st Amendment has, specifically, made two changes in the Constitution: first is the inclusion of a proviso to Article 175 of the Constitution, and second is the addition of 4 legislations, at entries 6, 7, 8 and 9, in the First Schedule of the Constitution. “Provided that the provisions of this Article shall have no application to the trial of persons under any of the Acts mentioned at serial No. 6, 7, 8 and 9 of Part I (III) of the First Schedule, who claims, or is known to belong to any terrorist group or organization using the name of religion or a sect”. The said two amendments are interconnected to each other in the way that on the one side, the legislature has carved out an exception in the existing judicial system of the country, and distinguished the trial of persons, under any of the laws mentioned in the said entries of First Schedule of the Constitution, from the regular trials, while on the other hand, has avoided them the protection of Article 8 of the Constitution, by putting them in the First Schedule of the Constitution. The pertinent thing to note here is that that the trial, under the above mentioned laws, shall only be conducted of the any person who “claims”, or is “known” to belong to any group or organization who uses the name of “religion or a sect”. The trial of all those terrorist individuals and organizations who uses the name of religion or a sect, to justify their inhumane acts, would be prosecuted under these Acts. However, to further restrict the interpretation of applicability of this provision, the expression ‘sect’ has been defined in the 21st Amendment, and it does not include any party regulated under the Political Parties Order, 2000. By giving this definition, the legislature has given specific protections to the ‘political terrorism’ being done by different political parties. In sum, this proviso has created a judicial system, which would work “in aid of” the Supreme Court of Pakistan, as has been required by Article 190 of the Constitution. In the case of Liaqat Hussian Vs. Federation of Pakistan, it was held that “Constitution recognizes only such specific Tribunals to share Judicial powers with the above courts, which have been specifically provided by the Constitution…” Since, after learning from past experiences, and in accordance with the jurisprudence established by our superior Courts, the legislature has established these military courts in such a way that they have given them the constitutional cover as required by the earlier judgments. One of the prominent judgment, with regards to the establishment of military courts, is in the case of Liaqat Hussain’s  case. However, it is important to distinguish the dictum of that case from the recent establishment of military courts. The above mentioned case challenged the vires of Pakistan Armed Forces (Acting in Aid of Civil Power) Ordinance, 1998, (hereinafter the “Ordinance”) for establishing martial law courts, under Article 245 of the Constitution, for trial of civilians, seeking the aid of military personnel. The Court, after taking into consideration, certain factors decided that the establishment of these courts, under the said Ordinance, are unconstitutional since they form a parallel judicial system for trial of civil and criminal matters of civilians. The Court further held that establishing such courts, under Article 245, is as such void since no courts can be established by bypassing Article 175 and 225 of the Constitution. The above said decision was reasoned on the ground that, per the judgment of Sharaf Faridi Vs. Federation of Pakistan, the Court held that the since the executive should be separated from the judiciary, this act of the legislature violated that line between the executive and the judiciary, and therefore it is unconstitutional. Lastly, on the issue of establishment of such courts, the court held that no law can establish any such courts which are parallel to existing judicial system, to try the civilians, unless expressly provided by the provisions of the Constitution. On the question that the trial in the martial law courts, under the said Ordinance, is violative of the fundamental guarantees as provided in the Constitution, the Court held that since the Clause 5 of Article 8 of the Constitution states that the fundamental rights, guaranteed by Chapter 1 of the Constitution cannot be suspended, unless expressly stated by the provisions of the Constitution. Now, as has been discussed above, through this 21st Amendment, the legislature has not only established the military courts for trial of civilians, but has given the courts constitutional cover, per the directive of superior judiciary. The rule laid down by the Supreme Court that the Constitution only recognizes those forums which has been expressly established by the provisions of the Constitution, has been acted upon by adding a proviso to Article 175 of the Constitution through the 21st Amendment. Therefore, this act of the legislature is even in line with the vague parameters defined in the case of Mehram Ali Vs. Federation of Pakistan when it says “as a corollary that any Court or Tribunal which is not founded on any of the Articles of the Constitution cannot lawfully share judicial power”. This means that any courts can be established, but they should be backed by the provision of the Constitution, as has been happening in this case of 21st Amendment. As to the question of fundamental rights, Article 8 (3) carves out the exceptions where the prohibition of Article 8 (1) does not apply. The legislature, with the specific intent of making the trials in the military courts more speedy and efficient, has made the fundamental rights non-applicable to those trials. For this purpose, the abovementioned laws have been added to the First Schedule of the Constitution which exempt the applicability of Articles 8 (1) and 8 (2). Through this 21st Amendment, the legislature has again given this amendment, as well as the amendment in Pakistan Army Act, 1952, the constitutional protection as provided in the words “expressly provided by the Constitution”, and therefore cannot be deemed as violative of fundamental rights. Keeping in view the discussion made hereinabove, it can be summed up that, after the passing of this 21st Amendment, a new trial system has been designed for prosecution of certain individuals, belonging to a certain group. It might be considered as violative of both the basic structure of the Constitution, by creating a parallel judicial system against the integrity and independence of judiciary, as well as the violative of fundamental rights and due process of individuals, however, there is no concrete principle on this issue as such. On the other hand, by giving protection of the Constitution, the actions of legislature, establishing the military courts have been justified and legalized. It is pertinent to discuss the constitutional provisions that play an important role in the passing of this constitutional amendment. Article 238 of the Constitution states that an amendment to the Constitution shall be made through an Act of Parliament. Article 239 of the Constitution lays down the procedure for passing the amendment, according to which a bill of the amendment can be originated in any of the two houses, and it shall be passed with a majority of two-third of the total members of the house. If the bill is passed from both the houses, it is presented to the President for his assent, otherwise it shall be sent back to the house from where it originated, for making requisite changes. Clause (5) of Article 239 of the Constitution bars the challenging of any constitutional amendment before the court of law. Clause (6) of the said Article states the absolute power of the Parliament to amend the Constitution. It is apparent from the situation that the 21st Amendment has been passed rightly in accordance with the procedure laid down in the Constitution, and therefore cannot be struck down on the touch stone of principles of jurisprudence as has been established by our superior Courts, that a constitutional amendment. Keeping in view the judgments of the honorable Supreme Court of Pakistan, it is important to discuss the essential elements of the Constitution, and their position in our legal system. It is most important to point out what has been decided in the famous Indian case of Kesavananda Bharati, where the Indian Supreme Court held that the Indian Parliament has limited power to amend the certain parts of Indian Constitution which constitute the basic structure of the same. As such, it has been observed that the drafting of a constitution is the responsibility of the constituent assembly, and any such assembly is given some basic features (points) which should be the basis of a constitution. 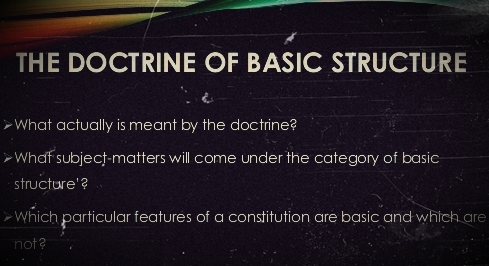 These basic features constitute what is known as the basic structure of a constitution. Basing on the principle, the judges of the Indian Supreme Court have listed down a number of features which, according to each one of them, makes the structure of Indian Constitution, on which it stands, and those very basic features cannot simply be amended through the legislative power, instead, it needs the constituent power to over write the existing structure. In this regard, it can be argued that the Constitution (of Islamic Republic of Pakistan, 1973) does have a basic structure in line with the principles established by the Indian Supreme Court. Firstly, the superior Courts of our country have not given a concrete precedent on whether there exists a basic structure or not. As it is apparent from the discussion hereinabove, the Courts have, at times, accepted the fact that there is a basic structure, but it can only be identified and not be enforced, and on the other occassions, it has observed that there is no such thing as a basic structure in the Constitution. If we apply the principle of Kesavananada Bharati’s case, one can argue that, indeed, there exist certain basic characteristics that constitute the essential features of the Constitution. Firstly, the popular opinion regarding the idea behind the creation of Pakistan is, “Pakistan ka matlab kia, La-ilaha illa-Allah”, on the basis of which, this Country was made in 1947. It has always been argued that the aim to get a separate homeland for Muslims was to give them the liberty to profess their religion, and therefore, the entire purpose of getting the homeland was based on this Islamic Ideology. Thereafter, pursuant to the creation of Pakistan, from the first Constitution of 1956 to the existing Constitution, it has been chalked out in the preamble of all the four constitutions of Pakistan, that the country (Pakistan) would be a democratic state based on the “Islamic principles of social justice”. Furthermore, the preambles also laid down that the residents of the country shall live in accordance with the teachings of Islam. As such, it is clear that now in the Constitution (of 1973), these Islamic principles, as well as the system of social justice based on those Islamic principle, have become substantive part of the Constitution, through the insertion of Article 2-A of the Constitution. Not only this, there are other provisions as well, which have made the Islamic principles a part of the ‘religious’ as well as ‘political’ lives of every individual. These provisions include, inter alia, Articles 31, 203-D, 227, 228, and 230. Under Article, 203-D of the Constitution, the third Constitutional Court, which is the Federal Shariat Court is constituted only to decide if any legislative instrument is against the injunctions of Islam. Article 227 of the Constitution specifically enumerates that no law is allowed to be made that is against the injunctions of Islam. To further the purpose enshrined in Article 31 of the Constitution, an Islamic Council has been created under Article 228 of the Constitution, whose functions (under Article 230) involve, inter alia, to advise the Houses on issues relating to ‘Islam as major part of our State’. Moving towards the end, the oaths of the President, Prime Minister, Federal Ministers, Speakers and Deputy Speakers, Members of the National Assembly, Senate and Provincial Assembly, Governor, Chief Minister and Provincial Ministers, also includes the swearing of protection of Islamic ideology “which is the basis for the creation of Pakistan”. To this end, it is clear from the scheme of the Constitution that Islamic principles, as taught by Holy Quran and Sunnah makes an integral part of the Constitution, and thus affect the lives of every single individual. It is also clear from the precedents and jurisprudence established by our superior Courts that in case of any conflict between the law and the teaching of Islam, the Islamic principle has been given preference, and therefore upheld. In sum, it is imperative to note that since the Islamic Principles have made an integral part of the Constitution, as well the lives of the residents of country, the Islam, as a religion, and its principles as given by the Holy Quran and Sunnah of the Prophet (PBUH) have become the ‘fundamental features’ or ‘basic structure’ of the Constitution. However, what could not become the basic structure of our Constitution is the system of governance, basic rights of its people, and independence of our State’s institutions. History witnesses the imposition of martial laws, and massacre of democracy in this country, and the validation of those martial laws and emergencies not only by the actions of legislatures as well as by the Courts of our country whose supreme function is to provide justice to the people. Through insertion of Articles 270-A and 270-AA, the actions of the ‘dictators’ have been validated in our country – the actions which have killed the democracy (a very basic feature of our Constitution) in their own hands, firstly in the era of General Zia-ul-Haq and then in the time of General Pervaiz Musharraf. On the other hand, in Syed Zafar Ali Shah’s case, the Supreme Court validated the actions of General Pervez Musharraf of 12th October, 1999. No way could the democracy be the basic structure of our Constitution. As such, the democracy could also not be deemed as the basic feature of our Constitution. Another feature that has been considered as the basic feature of the Constitution, which is the form of government, has also gone vague in this saga of political battles. In Pakistan Lawyers Forum Case it was said that “[t]herefore, it is no longer correct to think of the Constitution of Pakistan as providing for a purely parliamentary system according to the Westminster model. Instead, what can be seen is that over time, Pakistan has evolved its own political system so as to suit the political conditions found here. No objection can now be taken to the said system on the basis that it provides for a balance of powers (as opposed to concentrating all powers in the hands of the Prime Minister). As such, the vehement protests of the petitioners that the impugned provisions have destroyed the basic structure of the Constitution appear to be considerably overwrought and no weight can be placed on those arguments.” When our superior Courts have vehemently denied the existence of one particular form of government, no individual would dare making a contemptuous challenge to this decision. As a result, the governmental system is not something that has remained basic to our Constitution. Lastly, the fundamental rights of every citizen (person), as guaranteed by the Constitution, on the touchstone of which the Courts exercise their jurisdiction and examine the administrative actions, are not so ‘basic’ to the structure of our Constitution. As has been discussed earlier, Article 8 of the Constitution itself carves out the exception of non-applicability of the fundamental rights in certain situation. Similarly, under Article 233 of the Constitution, the fundamental rights stand repealed in case of promulgation of the emergency. These are few of the exceptions that could not be said to have not been availed by the executive in recent past. During the time of imposition of emergencies, the application of fundamental rights have been made unavailable. Similarly, as is clear from the text of the 21st Amendment, the exceptions has been made on availability of fundamental rights to the trial of select few individuals. Therefore, the fundamental rights do not constitute the basic structure of our Constitution, as they have remained a victim of the abuse of executive/legislative actions, which are then being validated by the Courts. As such, if teachings of Islam only constitutes the basic structure of our Constitution, then 21st Amendment does not affect the basic structure of our Constitution, and is therefore liable to be upheld. Since no dictum of superior Courts does, explicitly, make Islam as basic structure of our Constitution, it is arguable if the same does constitute one. However, one thing is clear that this is the only feature that has remained an essence before the constituent assembly of 1949 for writing the Constitution of 1956 (and therefore fulfills the criterion established in Kesavananda’s case), and that still is a touchstone before our Courts in deciding the fate of our State institutions. What constitutes the basic structure of our Constitution has always remained a question before our Courts, and no concrete answer has been given by the Court. Now that the validity of this recently passed legislative instrument (the 21st Amendment) is before the Supreme Court of Pakistan, and it has reserved its judgment on the issue, let’s hope that the Court decide the very basic question of existence of a basic structure in the Pakistani Constitution. If the decision is that religion is the only feature that is basic to our Constitution, then we are free from the encumbrances like violations of the other provisions of Constitution, or infringement of fundamental rights, or an attack on the independent judiciary, or the massacre of democracy.